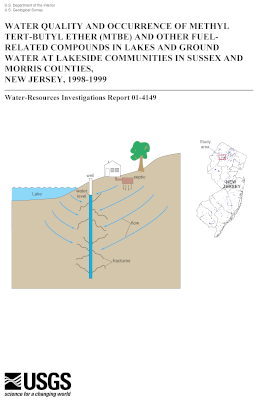 The cover of U.S. Geological Survey (USGS) Water-Resources Investigations Report 01-4149. One of many USGS reports authored by Dr. Arthur R. Baehr and his colleagues. Methyl-tert butyl ether (MTBE) in the atmosphere can be transported to shallow ground water. MTBE can degrade in the unsaturated zone. Used motor oil contains MTBE. MTBE in lake water can migrate to adjacent shallow ground-water wells. Computer simulation software can be used to optimize vapor extraction systems in the unsaturated zone.